Imagine the year 2022. Imagine 10,000 garments standing together in public spaces. Each speaking, " No Excuse For Sexual Violence. I Never Ask For It" Lets build this together. We are motivated by the conversations it takes to build #INeverAskForIt . We are motivated by the healing it could offer. We are also motivated by the idea that, building I Never Ask For It requires us to be each other's safe space. Our garments are our voice, witness, memory and truth. Step in. Offer Listening. Co Create. I Never Ask For It. There are , I Never Ask For It meet ups through 2018. 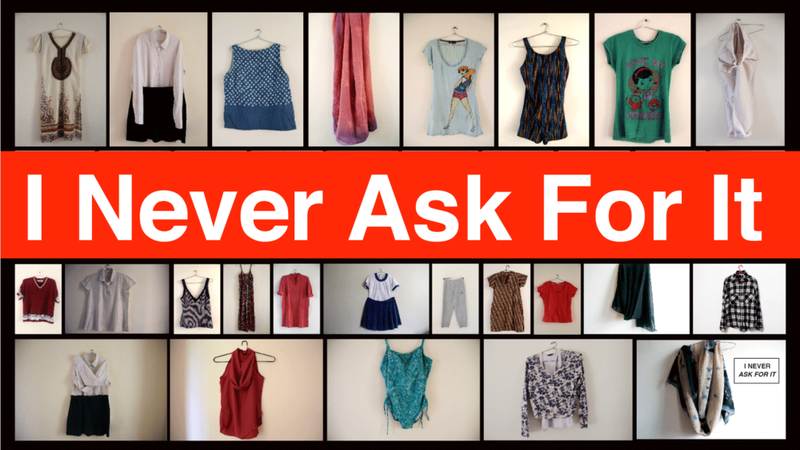 Look out for one where you live, mark your calendar, show up with the garment you bring to the I Never Ask For It mission. Bring the garment you wore when you experienced sexual harassment. Your garment is memory, witness, voice.